Yesterday's yesterday was the fourth of July, Independence Day. And I had an adventure well worth blogging. (Did you notice I kind of half gave up on blogging about my adventures?) I wanted to blog yesterday but my mind was just not up to putting words into coherent sentences – I actually wanted to blog immediately when I returned home early morning on the 5th but my body was physically exhausted and barely made it through a shower. So here's to today, the day I finally pull myself together and blog. The 4th started out just like any other day I am excited for: I woke up without the use of my alarm and turned off my alarm before it woke the whole family up. This 4th would be the first 4th I would not be spending with my family. So after readying myself, I ask my dad to drive me to the train station. There I get into line to buy a ticket for the train ride into Boston only to realize they don't accept debit cards. o_O Fortunately, I had enough cash in my wallet to cover the ride to Boston. I would deal with the ride home later. I arrived in Boston and met up with my friend, Jessica, at the Oval area of the esplanade. It was nice seeing my future roommate again! There we got wristbands for the evening concert with the Boston Pops. At the security check, Jessica's sunscreen was taken away because it was arsenal. I understand why but still lame. After, we checked out where her fraternity had set up tarps for the fireworks – they had ventured out to the esplanade at 5 AM to get those spots and prime spots they were. The fireworks were right above us, but more later on that. After that, we walked to Jessica's fraternity house to check out where I would be staying for the night. Jessica was staying at a fraternity house for the summer. Next, we met up with another friend, Kathy, at her dorm – she's staying in a BU dorm. I miss Kathy's energy. There we realized Kathy was roommate-less so I asked to stay with her since I rather sleep on a bed then a couch. We were all starving at this point so we decided to walk to Panera. There we ate and talked for a good chunk of time. Next, we decided to head to Newbury St. On Newbury St. we basically AC hopped. It was brutally hot outside and every chance we had to enter an AC building we took advantage of it. We even sat in a Best Buy for a while looking at televisions. Jessica and Kathy wanted frozen yogurt so we ended up at Pinkberry. As much as I like frozen yogurt, I'm not a fan of Pinkberry's ridiculous prices and did not have any. There we waited for my next friend to arrive, Mariam. However, there was miscommunication and we were at different Pinkberry. We ended up meeting her at the Mass Ave. Newbury St. corner, aka inside Best Buy. It was really nice to see my HB (Hug Buddy) again. I had texted my friends, Aneena and Huot, from home and they too were going to meet up with us. So between now and meeting up with them, we went to a BBQ at another friend's fraternity house. Huot and Aneena arrived around 6 PM and we had heard rumors that the esplanade was closing at 7 PM. So we set off to the esplanade. There we also met up with my friend Jenna and her roommate. Jessica and I ended up not going to the concert physically but we still enjoyed it very much over the speakers organizers placed around the esplanade. Jessica's fraternity had set up their tarp right next to speaker nine. We played cards, ate food, sung patriotic songs, and just hung around until the fireworks. I'm glad my home friends and my college friends got along chummily. Two of them even collaborated in swiping Cheese-Its from a nearby tarp (don't ask). 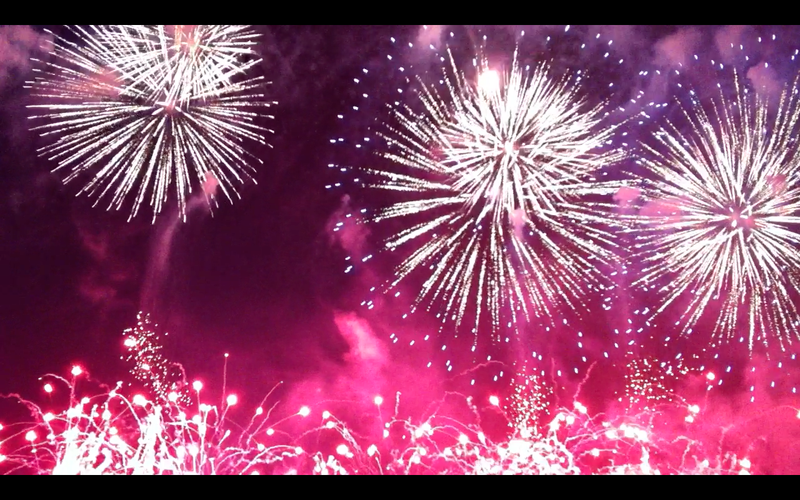 The fireworks were amazing!! I love fireworks. (If I fail at becoming an imagineer, I will become a pyrotechnician.) The fireworks were choreographed to music including Katy Perry's Fireworks – of course, right? Like I said earlier we were in prime fireworks watching spot. The fireworks were overhead and so close. So close that during the fireworks a firework shell had actually fallen onto my friend Huot. What an experience! I recorded the Boston Pops Fireworks Spectacular. But it's like a 1.3 GB video and would take way to long to upload. So a picture will suffice. "And the rockets red glare, the bombs bursting in air . . ."